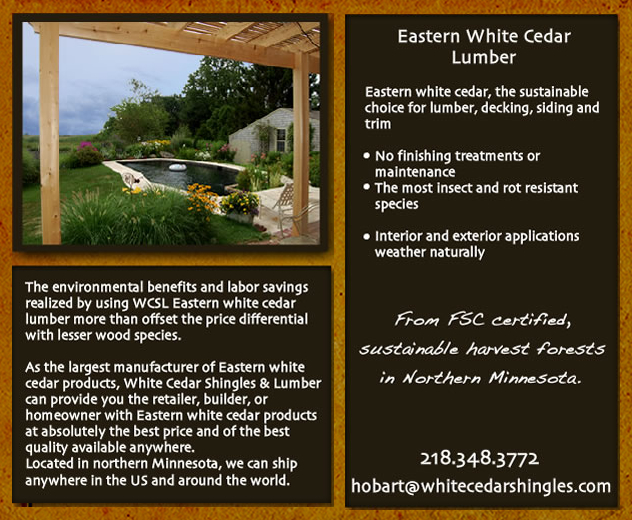 The environmental benefits and labor savings realized by using WCSL Eastern white cedar lumber more than offset the price differential with lesser wood species. As the largest manufacturer of Eastern white cedar products, White Cedar Shingles & Lumber can provide you the retailer, builder, or homeowner with Eastern white cedar products at absolutely the best price and one of the best quality available anywhere. Located in northern Minnesota, we can ship anywhere in the US and around the world. From FSC certified sustainable harvest forests in Northern Minnesota.